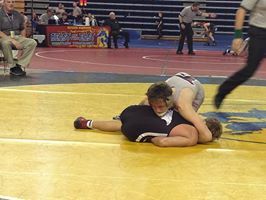 The Beast of the East is an individual double elimination wrestling tournament that Fauquier wrestling team has been attend dating back to 2007. Taking place at Univ.Delaware, Newark DE., this is a high intensity, nationally ranked event that showcases teams’ best wrestlers from Pennsylvania, Maryland, Virginia, and of course Delaware. In fact six of the top seven Virginia wrestling programs plus others were in attendance which should prove that Virginia had its BEST public and private teams in attendance. Clearly this is the toughest tournament on Fauquier’s schedule each year. Fauquier only entered six wrestlers in the 21st Beast of the East tournament as underclassmen would make up the Falcons lineup. You had to believe a desire to wrestle the best and win would be the goal and wonder if any wrestlers wished for a placement in this tourney as a Christmas wish. But faced with the breeding ground of the Beast, simply lacing and tying one’s wrestling shoes with medical tape would not be enough to tackle the experienced and elite senior level wrestling class from across the east coast. But Fauquier did more than just show up; they won matches. To highlight the first day at the Beast, team Fauquier went 12 and 8 with all participants earning two and three wins except for one. Having Matt Raines and Garrett Tingen run off three consecutive victories in a row made them the only two Falcons advancing onto the second day of the 3rd toughest wrestling event nationwide. 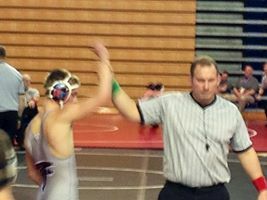 In 2007 team Fauquier advanced three wrestlers onto the next day where Nick Cook earned the title Beast Champion. In 2008 one of Fauquier’s best squads ever had advanced five wrestlers onto the second day with Chris Moon making a run to the finals as he earned a second place finish. In some sense the Beast of the East is a structured event where seniors get a chance to showcase who they are in front of College and University coaches. With local, state, and regional post season high school wrestling events that bring on personal achievements, placing at the Beast puts individual wrestlers on an elite poster board with blinking lights most college coaches can see. Not to knock the post season state tournaments, but the Beast is the top shelf event which oversees all others. Even though team Fauquier had no seniors to battle in this 2013 Beast they were recognized and noticed nonetheless. So as day two started Matt Raines and Garrett Tingen rested in the Championship Quarter Finals. They both had a bout with the number one seeded wrestler in their weight class. For Matt and Garrett the moment to win and move into the Semi-Finals would come up short. Over powered in these bouts, maybe, but team Fauquier came home with a 12-12 team record. Coach Fisher perhaps may have hoped to have more achievements as the exposures at this high-level event will surely improve each wrestler’s game. 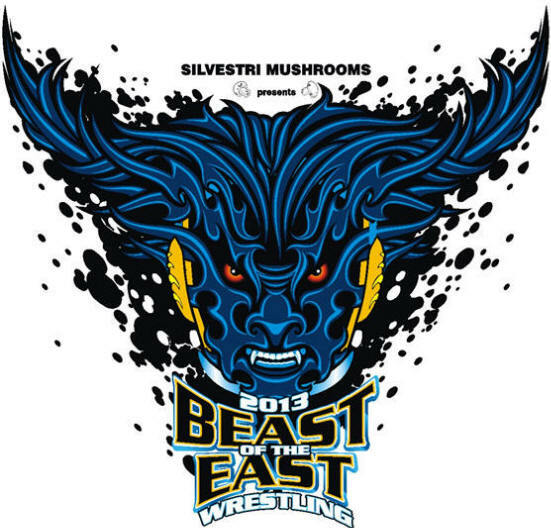 More complete tournament coverage of the Beast of the East can be found at: Track Wrestling. What’s Next: The Falcons will look to continue to hit the mat over the holiday break as they plan to travel to Mount Mat Madness on Dec. 27-28, Univ. of Maryland Baltimore Co. Camp., Catonsville MD. This will be an individual bracketed tournament as wrestlers advance forward through the champion rounds if they win. Currently there are 30 teams entered at this tournament. Below are the team and individual results from the Beast of the East. Round Notes: Team went 0-2. 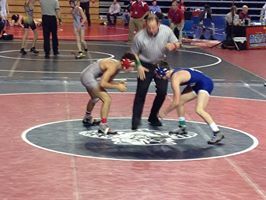 113 Daniel Ariola lost 10-4 to Lou Ramio, Hanover Pa.
126 Kyle Roche lost by Fall to	Sam Cali, Don Bosco Prep. Round Notes: The Falcons posted a 2-4 record with one Tech Fall. They currently have earned 6.5pts. with these wins and are within the top 50 out of 100 teams. Round Notes: Fauquier went 1-1 this round with 2 Byes. Round Notes: Fauquier went 2-1. Fauquier has 17.5pts still inside top 50. Round Notes: Fauquier goes 2-0 with one Fall as they both advanced to the Championship Quarters. Round Notes: The Falcons earn a 2-0 match record this round.